Simple crafts and ready-to-go/print ideas have essentially been our "art time" over the last few years. My extent of art knowledge and styles is minimal (at best). I might be able to identify some very famous paintings, but definitely not specific styles or the masters of art history. 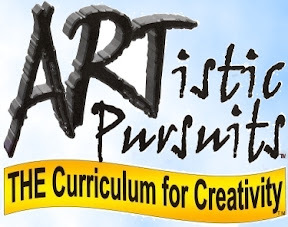 ARTistic Pursuits has a complete K-12 art curriculum written for homeschoolers by homeschoolers. They provide art instruction in areas such as visual art, art history, modern art, the elements of art, and color and composition. Their curriculum books show student examples of the projects along with detailed lesson plans for the projects. Each book is also non-consumable, so it can be used over and over in the years to come with each child in your family! 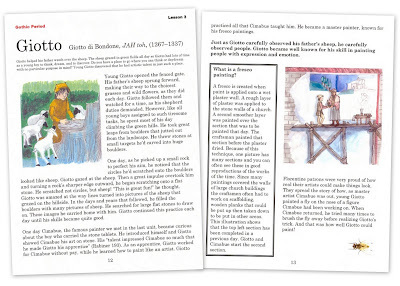 We received ARTistic Pursuits, Grade K-3, Book Two, Stories of Artists and Their Art ($42.95) to review and seeing it person has made such a difference! I had heard of ARTistic Pursuits before but never looked into it further - and I wish I had. I love it! The Ellis' have put an amazing amount of time, research, and effort into developing a comprehensive and quality curriculum for homeschoolers. Because we've been studying castles and knights, the first few lessons in this book were great for us to use. We read about Giovanni Cimabue (1240-1302) and did several projects including a watercolor painting and also "gold leaf". Both used easy to find supplies and the girls were able to follow the project directions without any assistance from me. I've read through the artist biographies and learned a lot myself! 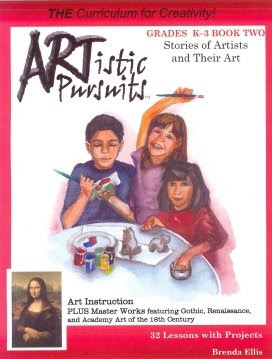 ARTistic Pursuits, Grade K-3, Book 2, Stories of Artists and Their Art features various works of art and draws the students attention to details in the paintings then explains the importance of what the art portrays for that artist or time in history. Art history periods taught include Gothic, Renaissance, Northern Renaissance, Mannerist, Baroque, Rococo, Romantic, and Realist. The book also contains a materials list for the art supplies needed for the various projects, grouped together for easy reference, so you know what is needed for each "class time". Supplies are available in discounted bundles through another website or can be purchased at your local craft store. Purchasing the art supplies is the only prep you need to do for the lessons - it really is that simple! ARTistic Pursuits has taken a subject that can be very intimidating for parents (and often overlooked as a result) and made it incredibly easy to teach by providing an excellent curriculum for homeschooling families. of this product and other products available from Artistic Pursuits. You are the second homeschooler (that I know) who has highly recommended Artistic Pursuits! Thanks for the wonderfully descriptive review. I appreciate it.